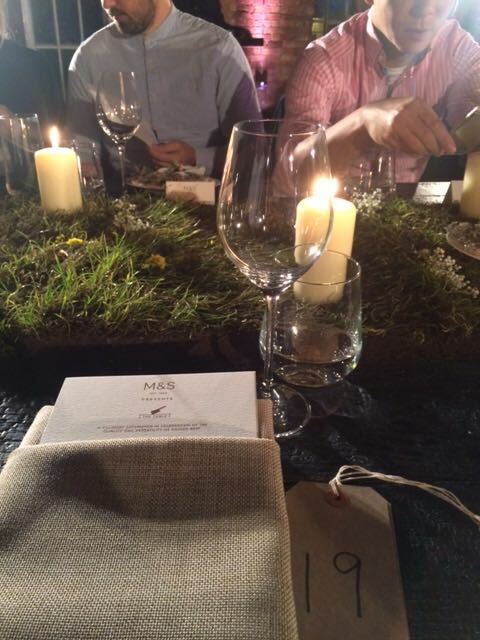 The M&S event The Table was dedicated to the quality and versatility of British beef. Never ones to shy away from an eclectic menu, every course had to incorporate an element of beef. Guests were welcomed into the venue to the gentle sound of cows and the tables were decorated with grass. Once everyone was seated, after enjoying drink and canapés, the host introduced the evening, explained the concept and information on where the beef has been sourced. All guest received tasting notes, which also helped bring the flavours to life, and create excitement for each course. 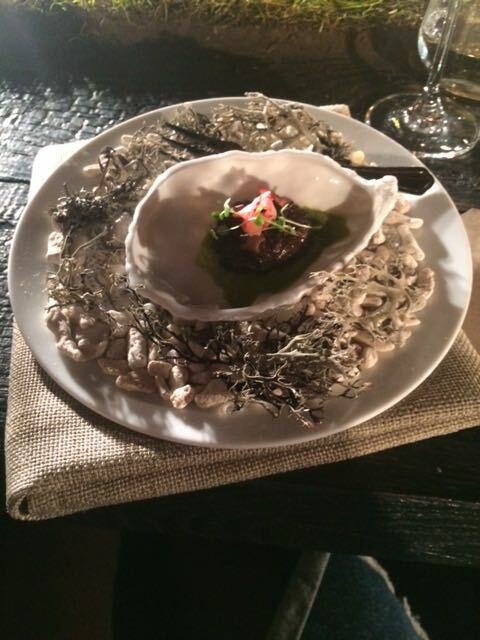 The first course, and theme was meaty- crispy oxtail, mushroom with samphire. The beef was incredibly tender, having been slow cooked- creating an intense flavour. The course was also accompanied by a Bloody Mary, which added an element of spice. 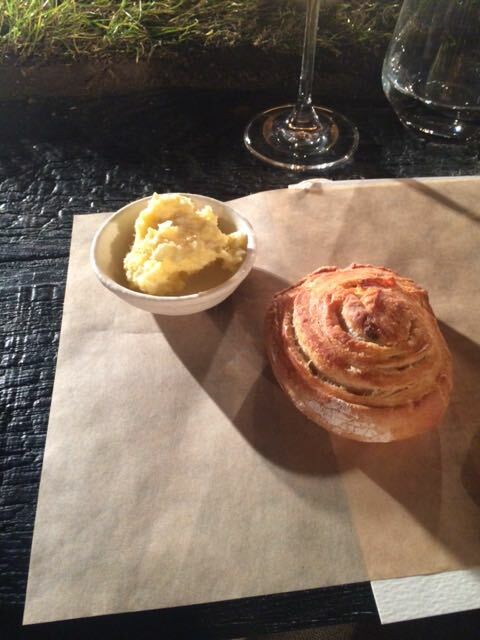 The next theme was mustardy- dripping bread with horseradish butter. The crispiness of the bread with the creaminess of the butter was delicious, and in this instance the butter that would normally be used was replaced with beef dripping. The delicate flavour was intensified with wine. Before the next course, one of the speakers discussed the question of wine with beef, suggesting that the assumption that only red wine goes well with red meat wasn't necessarily the case. So for the next course, we were given both a red and a white wine to sample. 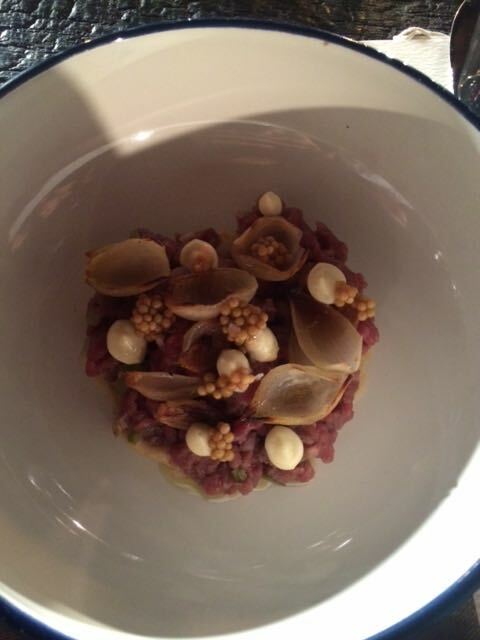 The theme was picked- tartare of salt aged beef fillet, grilled baby onions and pickled mustard seeds. This course was my favourite. The beef tartare was delicious and the onions were incredibly soft and added flavour without being over powering. I also enjoyed the white wine with the course, and actually had a preference for this, although the red wine had an incredibly deep flavour. 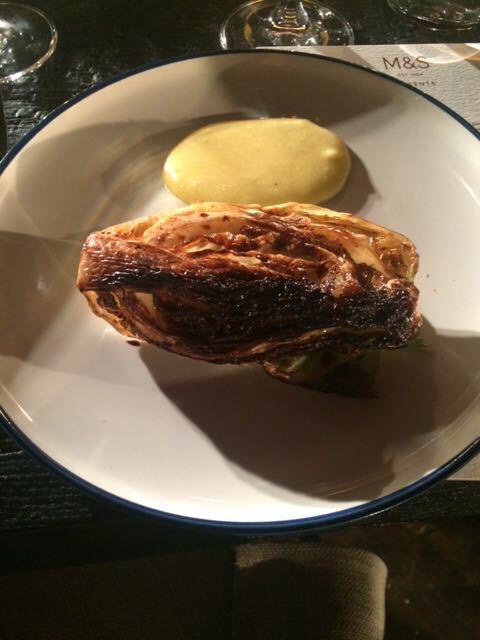 The next theme was sulphurous- charred sweetheart cabbage, smoked hollandaise with dried Ox heart. The smoked hollandaise added a rich flavour to the cabbage and the dried Ox heart created an interesting texture. 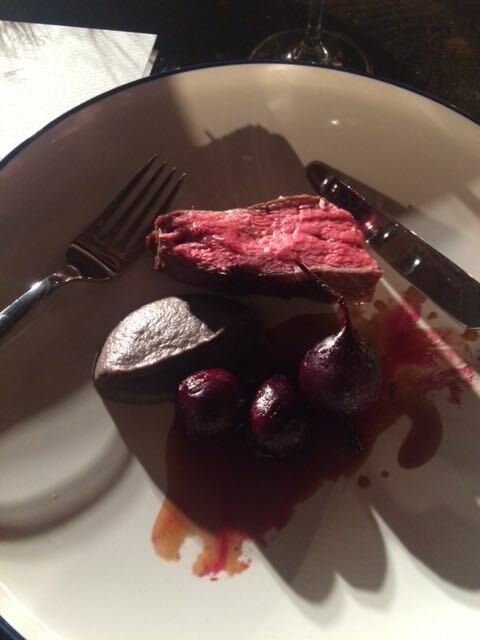 The next theme was earthy- aged rump cap, burnt aubergine and smoked beetroot. The beef was incredibly tender and the beetroot added a sweetness to the more savoury meet. The burnt aubergine was also delicious. The next course was the beginning of the deserts. 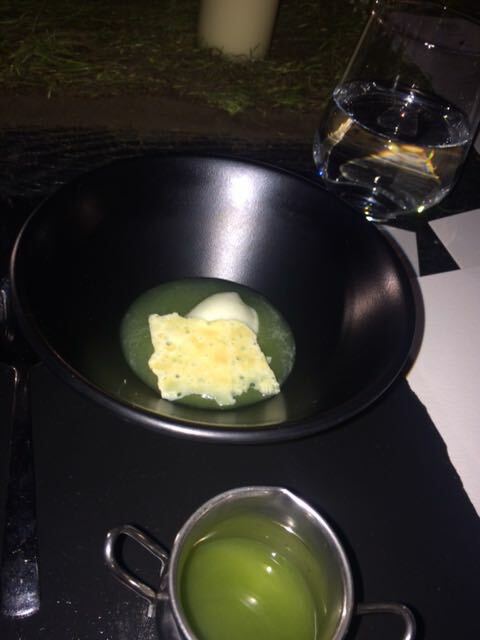 The theme was green and grassy, and the menu simply read milk and grass- much to the intrigue of the guests. The milk was in fact a yogurt, consisting of sweet hay, light malt and green apple. 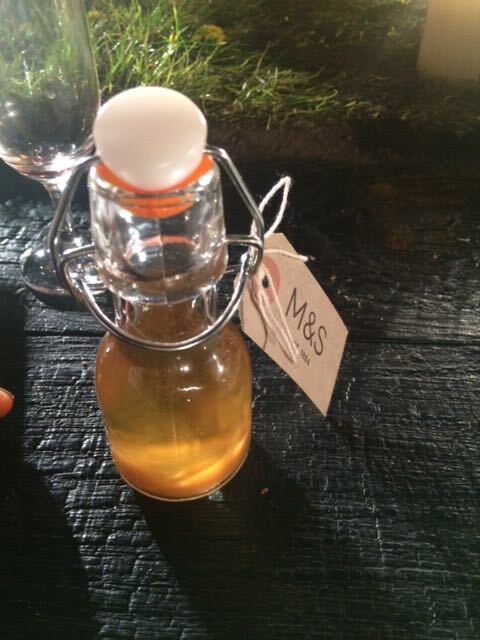 The grass was a sauce, made of chlorophyll, hints and green apple and Galia melon. The textures complemented each other well and was a delicate way to follow the strong flavours of the meat. 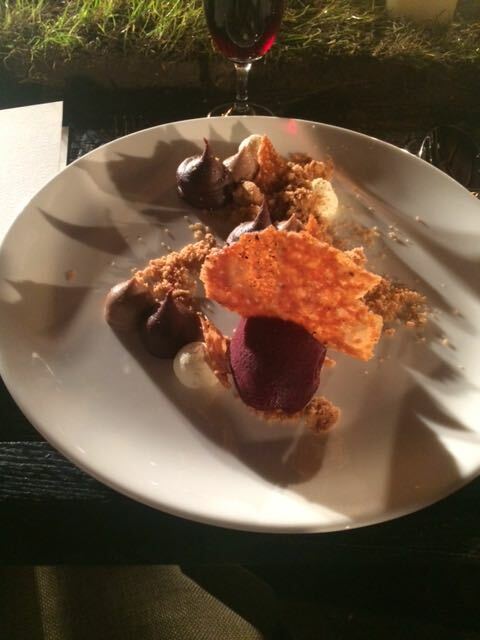 The next theme was woodland- hazelnut beef shortbread, blackcurrant with miso and tahini. The blackcurrant was in the form of a sorbet, which had a sweet but tangy taste. This went perfectly with the shortbread. The hint of beef was very subtle but enough to give it a element of something special. We ended the evening by toasting British beef with a roast beef washed whisky with hints of heather honey and orange. The evening was perfectly executed and the chefs did an outstanding job with such eclectic and creative courses. They all give some great ideas on how any of us can use different flavours to make an exciting beef dish at home.